I was just about to say something, how do you look so wonderful in the morning?! my eye bags are still dragging on the floor by noon! Looks like everyone had a wonderful Christmas! love your blog! Looks like the perfect Christmas morning! And I agree, it's not fair how you look first thing in the morning! your such a sweet adorable family!! i love every single picture. . . seriously, best christmas ever! What a cozy Christmas, love the PJ's! Sounds like such a fun Christmas! I love Ashlynn's face when she opens the gifts! Seriously seeing the joy on the kids faces is all the presents I need. My son got that farm too and is in LOVE with it so far! Hope A loves hers! Looks like you had a great christmas as a family of four! It was definitely a great first Xmas in our home and as a family of four! You are so right! Best part of the day! Thank you! I usually don't wear pj sets, but I'm now converted, love then! 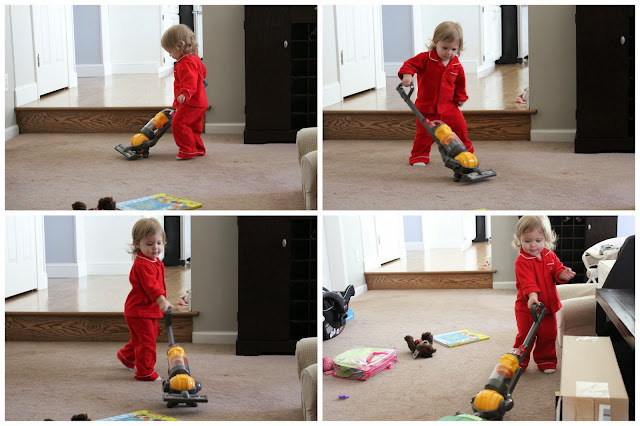 The vacuum is amazing, such a mini me! Gotta love a slicked back high pony and swipe of concealer for my new baby bags under my eyes! Happy Christmas with two kids, girl! Love it.